Monitor Audio Silver RX8 review | What Hi-Fi? So far, all the speakers we've auditioned from Monitor Audio's Silver RX range have pushed hard for class-leading status. But now we're heading up a division to the heavyweight, range-topping RX8s. 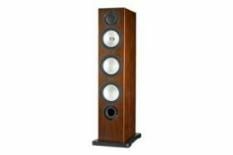 They're larger in price as well as stature, but has this been matched by an increase in sound quality? Well, yes and no. The RX8s are beautifully made and among the finest-looking floostanders you'll find for this kind of money. The walnut real wood veneer looks classy and contrasts nicely with the metallic-looking C-CAM (Ceramic-Coated Aluminium/Magnesium) drivers. For an extra £200 you can enjoy the towers in a black or white gloss finish. The RX8 is a two-and-a-half-way design and uses twin, 15cm bass drivers together, a 15cm mid/bass unit and gold dome tweeter. Considering the number of drive units being used, they show a remarkable sense of togetherness. Integration is impressive and all the drivers combine to leave a solid, seamless soundstage. The 8s are the same width as the RX6s, but taller and 7cm deeper. This increase in the internal volume allows for a rise in low-frequency output. The results are dramatic, with the quantity of bass highly impressive. Fed hip-hop or dance music, the RX8s are in their element. The bassline to Notorious B.I.G's anthemic Hypnotize has a meaty impact. But all this extra bass weight comes at a cost. The usually agile and punchy bassline sounds fat and there's a lack of distinction between the notes. This slows down delivery and prevents the RX8s from timing accurately. High frequencies have a good level of detail and they're expertly controlled with no hardness to speak of. The midrange is similarly detailed: vocals are clear and crisp. If you're addicted to bass, these RX8s will be a real hit. But if you don't pine for extra low-end oomph (which comes at the expense of grip and timing) we think the Silver RX6s are a better all-round proposition.